You have chosen a site, a design and the kind and color of patio paver you want to put in your yard. Now begins the construction phase. Each decision regarding your new patio or walkway is important, but the foundation you begin with will determine how long your new construction will last and the overall success of the project. The base of your patio or walkway requires some research before you pick up a shovel. You should choose the type of sand and gravel to lay under your paver before you begin digging. You should also have the type of paver picked out so depth can be determined. 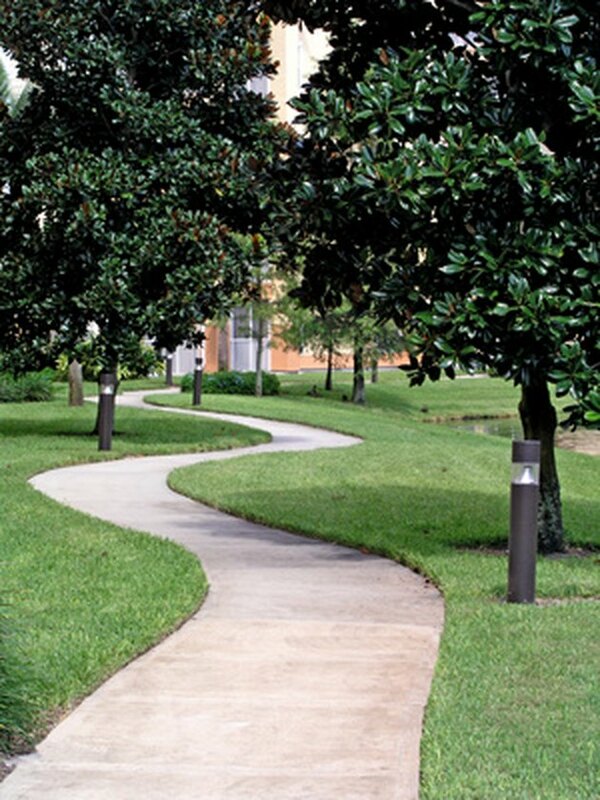 Beautiful paver designs begin with planning. The preparation of your subsoil and paver bed is very important to the project. The overall strength of the patio or walkway is dependent upon the correct preparation and placement of subsoil and base materials. You will want to begin by marking the area to be paved and placing wooden stakes around the area. Spray painting the area to be dug out is an easy way to see the boundaries for digging. Before your dig, make sure your site will have proper drainage and will not hold water once the pavers are set. You will also need to determine the possible location of underground wires or plumbing so these can be avoided. Stake the corners of your site, and excavate the top soil and subsoil within the staked area with a shovel to a depth of about 9 inches, depending on the depth of your chosen paver. Most pavers are 3- to 3 1/2-inches thick. This excavation will allow for a base material of about 5 inches to be placed at the bottom of the excavated trench. Once you have completed your dig, compact the soil and begin laying the gravel. Wetting the gravel lightly with water will help compact it as you put it into the site. Walking across the gravel will also help to compact it. Continue to add gravel in layers until the base is approximately 3 to 3 1/2 inches from the desired level of the finished grade. You will need to put 1-2 inches of setting sand on top of your gravel to help compact it further and secure it to the soil. Fill in any low spots in your gravel with additional sand and repeat until your site is level, with a slight drop for drainage. Do not step on, compact or wet the sand after you have finished "screeding"—the term used for compacting and leveling your soil. Your site is now prepared and ready for your pavers. Once you have made your successful dig and prepared your site for your pavers, don't neglect to plan for edge restraints that will keep your base and pavers from shifting from age and weather. You can purchase your restraints from most gardening centers. They are normally a black polymer or plastic. You will want to secure the restraints along the edge of your pavers and stake them about every 16 inches. Driving the spikes into your prepared base below your pavers at different angles will improve the holding power of the restraint to the earth. Having the proper depth for your base will hold your restraints and stakes securely against your pavers.